Papua New Guinea is like no other country in the Pacific. While its neighbours all share a similar mix of tropical island and fringing reef, Papua New Guinea stands out from the rest. To put the country into context, Papua New Guinea has 2 times as many fish species as the Red Sea and 10 times as many species of coral as the Caribbean. Within the flat expanse of atolls that characterize the Pacific Papua New Guinea dominates, with dozens of mountains above 3000m and the highest being Mt. Wilhelm at 4509m. 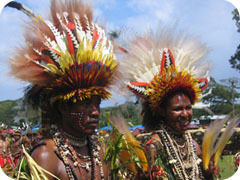 The Papua New Guinea people have around 1000 separate cultures and speak over 800 languages. 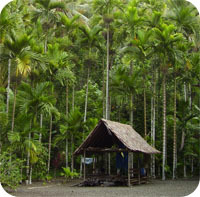 Indeed, Papua New Guinea boasts the largest area of intact rainforest outside the Amazon. Ranked as one of the Top 5 most biodiverse countries in the world Papua New Guinea is home to 21,000 types of higher plants, 200 species of reptiles, 13 species of turtle, 700 species of butterfly, 242 species of mammals and 762 species of bird. And that is just what’s known! Settled around 50,000 years ago almost 6 million people share this magnificent country. Characterised by mostly subsistence living, ancient traditions and rituals continue to be practiced today. Variously colonized by the Dutch, Germans, British, and Australia, Papua New Guinea officially gained independence on September 16, 1975. Due to its extraordinary amount of natural resources the primary industries in Papua New Guinea are mining, petroleum, fishing, forestry and agriculture. Occupying the eastern most tip of continental Papua New Guinea where the Owen Stanley ranges crash into the Pacific, Milne Bay is a world within a world. With no roads connecting it to the rest of the country Milne Bay is a quiet piece of paradise. 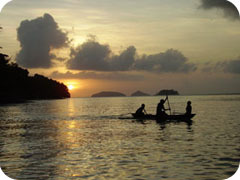 Being largely made up of water, the Milne Bay people are great mariners with traditional dugout canoes and sailing boats continuing to dart across the horizon today. Milne Bay is home to almost 500 islands ranging from your typical tropical island and tiny atoll through to massive volcanic and continental islands. Located on the corner of the Coral Triangle, Milne Bay has some of the richest marine biodiversity in the world making it an established mecca for divers, and an emerging destination for game and sports fishermen. Serviced by a number of hotels, shops and banks, and with staggeringly friendly people who widely speak English, Milne Bay is a must-see destination for anyone wishing to visit Papua New Guinea.